Found one file extension association related to Kivio and 1 file format developed specifically for use with Kivio. 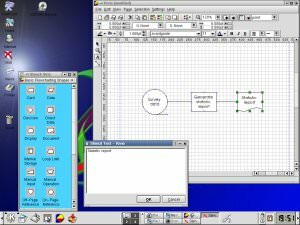 Kivio is a Visio style of application that allows you to easily create diagrams and charts by using a large library of pre-defined "stencils". Multiple paper size support. All standard paper sizes are supported (letter, A4, etc...), and you have the ability to create your own. Multiple pages per document. Organize your document according to your own needs. No need to be locked to a single canvas. Grouping. Select any stencils you want, and group them into a single element for easier manipulation. Clipboard history. Paste previously copied stencils! Layer support. Stencils can be laid out on different layers for easier organization. Customizable user interface. If you do not like the layout of the screen by default, drag the various elements around until you are satisfied. Some elements even allow you to change their colors for a more pleasing look. Dynamically resizing grid. As you zoom in further and further on a document, the grid will constantly refine itself to allow you to place your stencils with more precision. Stencil builder. Want to create your own stencils without doing any programming? Use the built in stencil builder to draw your own stencils. The Kivio software seems to be old or discontinued. If you need more information please contact the developers of Kivio (theKompany.com), or check out their product website.